Owning a clothing store is not an easy endeavor by any stretch of the imagination. The clothing store owner needs to worry about inventory levels, attractive pricing, employees, and host of other day-to-day issues. The last thing a clothing store owner wants to worry about is a faulty register or outdated software. Furthermore, the right clothing store POS system will address most of those issues. In addition, the best clothing store point of sale will increase efficiency across all marketing and sales channels. Few of the notable features are automated loyalty programs, real-time inventory management, hot items report, shipment automation. Finally, sales tracking and accounting automation are simply an added bonus. We researched our favorite clothing store POS systems. Below are our top picks to streamline the success of your store. That’s why we’ve gone through the trouble of comparing three retail POS systems for you. 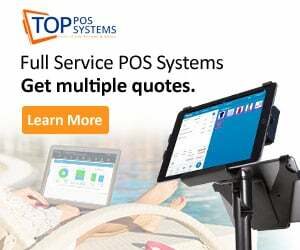 Below is our review of three POS systems that can help expand your clothing store so that you eventually become the talk of the town! Customer Support Business hours customer support and online 24/7 multiple formats 24/7 multiple formats. Quetzal is a POS system that is specifically targeted toward smaller, independent clothing and shoe retailers. This type of focus has allowed them to develop a POS system that is loaded with features to make clothing store owners’ lives easier. Furthermore, the specific targeting helped it go above and beyond to make sure it’s interface is sleek, modern, and easy to understand and master. Some might consider this a downside to Quetzal, but it depends on what your goal is. Quetzal is for smaller clothing outlets, so if you are a multi-chain clothing outlet this maybe isn’t your best option. But the upside to this is that all of Quetzal’s features are really fine-tuned toward this specific demographic. They don’t really push limits or boundaries, the developers stopped precisely at the point where they feel Quetzal works as intended, with the fewest amount of problems possible. Quetzal is intended to be an iPad POS system, which is great for small mom-and-pop type clothing outlets that are trying to display a modern aesthetic. But it can also be run off internet browsers. It works with the latest versions of Chrome, Safari, or Firefox. However, Quetzal does say that the best possible experience for the retailer comes from running the POS system off an iPad. There are some additional peripherals needed to run Quetzal, such as cash registers and receipt printers. They are kind enough to let you purchase the necessary hardware directly from them to avoid any incompatibility issues. There are going to be hardware startup costs for any POS system, however, so this isn’t a negative mark. Loyalty Program: automatically tracks points when customers make purchases. The number of points per purchase can be modified by the retailer. The rewards and points can all be fully customized by the retailer to fine-tune your loyalty program. Accounting: direct integration with Apple’s Numbers as its spreadsheet application of choice. This can be imported into Xero or Quickbooks for easy accounting management. E-Commerce: direct integration with Shopify, which is a hugely popular platform among small businesses. Advanced Analytics and Reporting: detailed reporting and analytics are available to help you see where your store is shining, or where it could use some work. Employee Leaderboard: keep your work environment fun with a competitive leaderboard that tracks top sellers. You could even set-up employee of the month type rewards. Standard Support: $75/month per location. This option comes with 1.5 hours of assistance during setup through email support. Advanced Support: $100/month per location. This also has the 1.5 hours of email-based setup support. There are no setup fees or contracts. Both plans come with free integration with Shopify to make sure your store can reach that online market right from the beginning. Quetzal is a hybrid system, meaning that it runs locally on an iPad/browser itself, while the data it records syncs with a cloud for storage and back-up. This structure allows the front-end register tasks to be directly accessible by everyone on the iPad, with the more detailed back office tasks being accessible via the browser. Quetzal is designed to mirror the iOS interfaces, specifically for iPads. Whether that is a pro or con depends on if you like what Apple has done with ease of use interfaces. Regardless of preference, simplicity is the forefront. No convoluted menus or hard-to-find features will plague you with Quetzal. The nice thing about Quetzal is that most of its support features come standard with its two pricing options. For an extra $25 a month you can obtain some advanced support features. Extra training and setup support is also available for purchase, but the whole installation process is so simple that you probably won’t need it. Setup: one hour is provided with a specialist upon the initial purchase of a license. Phone: live phone assistance during regular North American business hours (7am to 7pm). Knowledgebase: an online support center that provides pictures to go along with its detailed explanations. Email: 24/7/365 email support is free to all users. The obvious drawback is that this is geared at smaller businesses. But that’s not really a drawback, just some honesty about who they are trying to reach. Still, if you have over 10 clothing retail locations, Quetzal isn’t the right choice. Other than that, there haven’t been too many negative reviews of Quetzal, mostly because it works as intended and is super simple to setup and use. Shopify makes it on the list because of affordability, good customer service, a variety feature list, a simple interface, and automatic integration with Shopify eCommerce. They also have some experience behind their belt, having been in the game since 2005. Let’s get right into their major highlight: affordability. There are a lot of pricing options, so selecting the best one is really a matter of what you need. Lite Plan: $9/month. This plan has no online store but still has 24/7 support. Basic Shopify Plan: $29/month. This plan has the online store and adds Facebook, Pinterest, and Twitter sales channels. 24/7 support. Shopify Plan: $79/month. In addition to the other features, this plan adds professional reporting and abandoned cart recover. Advanced Shopify Plan: $299/month. Gift card support, third-party calculated shipping rates, and an advanced report builder in addition to all of the other features included in the other plans. 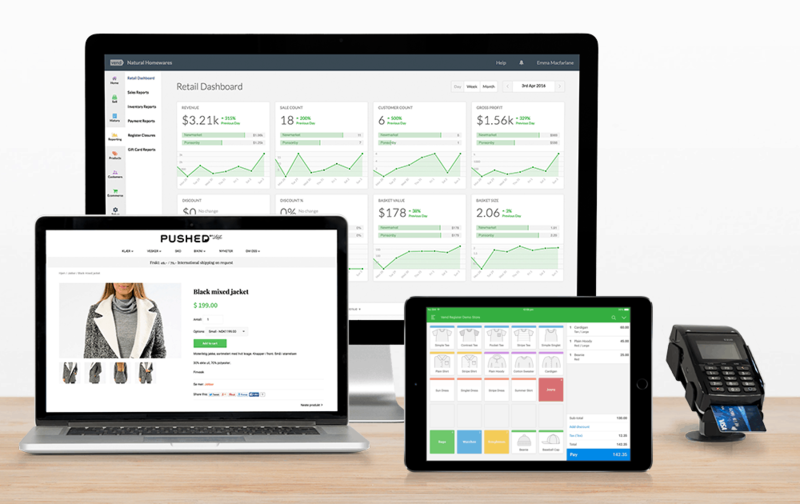 Shopify Plus: this is an Enterprise plan for large-scale business. Quote-based. Shopify is a web-based POS, but when you log into an app most of the data you will need is stored directly on the iPad itself. This allows you to process cash transactions without an internet connection. For credit cards, data is stored and will transmit upon regaining an internet connection. 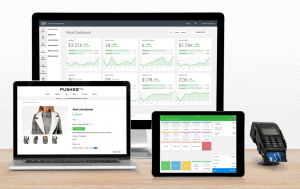 Shopify has a lot of nifty features to help with your clothing store. With a list like this, any clothing store should be able to craft a sale system that works for them. Can divide payments among two or more payment sources. Ability to create your own gift cards. Ability to offer direct refunds or store credit. Custom sale options allow you to add line items to be priced however you wish. Automatic tax calculations to help save time when it comes to tax season. Storage of shipping addresses of frequent online customers. Product management features, including but not limited to: product organization, inventory management, and barcode support. Store management features, including but not limited to: integration with accounting software, order histories of frequent customers, multiple staff accounts, reporting and analytics, and customer profiles. Shopify provides 24/7 support in multiple formats: live chat, email, and phone. For the most part, customers report that these support services are helpful. There is also an online knowledge base in case you want to have a crack at your issue alone before contacting support. Customers have reported several bugs in the software, but it’s likely that these bugs have been worked out or are being worked on already. Others say that the inventory functionality can use some overhauling to make it provide a little bit of extra performance for store owners. Rounding out our list is the user-friendly, reasonably priced Bindo. Offering unlimited customer support and advanced inventory management features, and sporting a database of millions of products, Bindo is an ideal solution for small, local businesses. Bindo is aimed at small retail industries. That includes clothing departments and other types of stores. 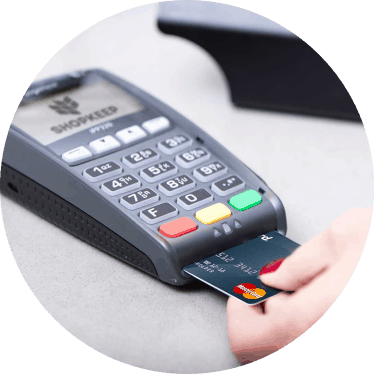 If you want a POS system that is specifically for clothing retailers, Bindo isn’t your option. But if you don’t mind figuring how to make Bindo work for your clothing store, it could be what you’re looking for. The company’s mission statement hints that it focuses only on small businesses, and the pricing plans that they offer reflect that. 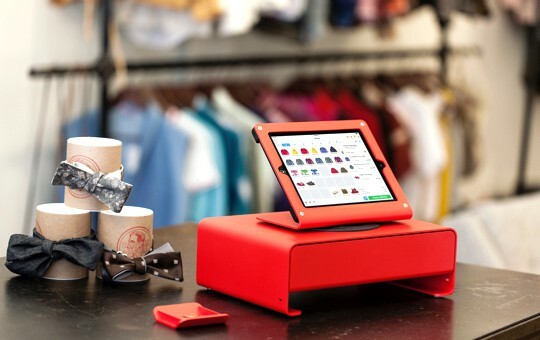 Bindo is also an iPad-based POS system, making it clean, intuitive, modern, and sleek. It shouldn’t take too long to learn how to use Bindo. There are quick data importing features, as well as simple tools for adding new items to your stock and creating product matrices. Bindo shines with its feature list. Register Features: the register system with Bindo is robust, giving you a variety of tools to help smoothly check customers out and handle any issues they may have. Inventory Management: no one wants to spend a lot of time doing inventory management. Bindo knows this and has included tools to speed up the whole process. Purchase Orders: see purchase orders in one place so that they can be modified or cancelled within a short amount of time and without giving you a headache. Loyalty Programs: reward loyal customers by creating a rewards program that they can take advantage of when shopping in your store. Permissions: subdivide employee tasks with specific permissions that only certain staff members can access on the software. Multiple store management: if you plan to expand or already have multiple locations, Bindo is already structured to integrate easily with larger businesses, with a whole host of features that are geared at making multi-location management a no-sweat process. If you’re not sure about Bindo, they offer a free 14-day trial with no contracts or commitments. After that, Bindo’s pricing schemes are varied. They offer quotes that are custom-tailored to the specific business that is working with them. An agent will be assigned to work with you and figure out the best pricing plan. This can be seen as a drawback for people who want to know what they are getting into before they go through the trouble of considering Bindo. Bindo should consider having cut and dry pricing options so that businesses have a better idea of how much they need to shell out. People have also complained that the customer service isn’t that helpful and that the tools for training are too limited. Clothing is a seasonal industry with seasonal inventory. Point of sale systems for clothing stores help manage that inventory. The systems track sales, report on best sellers, and help create orders for your next shipment. Along with managing your stock, you can upload inventory to your website. With ecommerce tools readily available, the online store will stay cutting edge and up to date. Tools for email marketing, text notifications, and automated loyalty programs help maximize success for promotion. A good POS system for clothing store also take all the sales data and report it back to you. Each sale is reconciled in the books, making accounting easy come tax season. Clothing stores, no matter the size, all operate on the same principle; giving clients plenty of options. Not having the right POS system in place to facilitate this need can hurt your business. That is why you should utilize this sales and reporting tool. Knowing which items are worth your shelf space is vital. Displaying the wrong inventory can really hurt your revenue. With a POS system designed explicitly for clothing stores, you’ll be able to know which items sell the most. There is also the ability to set the system to automatically restock an item once its inventory reaches a predetermined amount. This feature will save you valuable time and effort. Comprehensive reporting goes a long way in terms of tracking and forecasting. 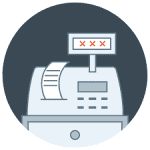 With a point of sale system like Shopify in place, you will be able to do your bookkeeping, quickly and easily. Easy to read charts and an easy to navigate interface make bookkeeping a breeze. Shopify will provide clear details about anything from total sales, busiest time of the day, and more. You can also see which items are selling well, when your store is busy, and what employee is selling the most. These are just a few features you’ll have access to. Having an online store is virtually a necessity in today’s world. Connecting your online store and your brick and mortar location will end up paying dividends. With a POS system like Bindo, you can link your online and physical stores. This means that your inventory will update in real time. Bindo will give you more accurate accounts of what you have available and what needs to be restocked. Synced information is valuable information. Having omnichannel capabilities will also give your customers more options, helping shoppers find the right outfit for them. Establishing loyalty programs can have a significant impact on your bottom line. Loyalty programs are a great way to surge revenue and reward repeat customers. Setting up a loyalty program is a painless process that will take only mere minutes. These programs will automatically track points when customers make purchases. The retailer can modify the number of points per purchase. The rewards and points can all be fully customized by the retailer to fine-tune your loyalty program. With the help of a loyalty program, you will be able to see what your most enthusiastic customers are buying. This information can help you decide how to stock your shelves. Running multiple locations can be a stressful endeavor. However, the right POS system can make this ordeal much less complicated. You will be able to sync up all of your locations in no time. All data from every location can be accessed from your home base. This data will let you see which stores are performing well and which ones need work. The ability to restock all of your stores at the same time with the press of a button is quite handy. This type of convenience will save you hours of work. You will no longer will you have to check inventory on a store by store basis. As mentioned previously, your clothing store operation should consider a POS system that can assist with employee scheduling, inventory management, loyalty programs, and other tools to help your business succeed. Our top choice for clothing store POS is Quetzal. Its software is super focused on smaller clothin store retailers, has upfront pricing schemes, and various features to make your operation thrive. For those who run larger retail operations, the next best system is Shopify, due to its integration with the Shopify eCommerce feature and the many additions and customizations you can make. At last, Bindo is also a solid POS system, and offers most of the features Quetzal and Shopify do, but lacks on customization at times.